My brother celebrated his birthday at Greeka Kouzina in San Juan. I can't remember the last time I have been there, all I can remember was the appetizing food that we ordered. He knew that DH and I are watching our weight so he ordered two salads- Greek Caesar and Fig Arugula (not in the photo). 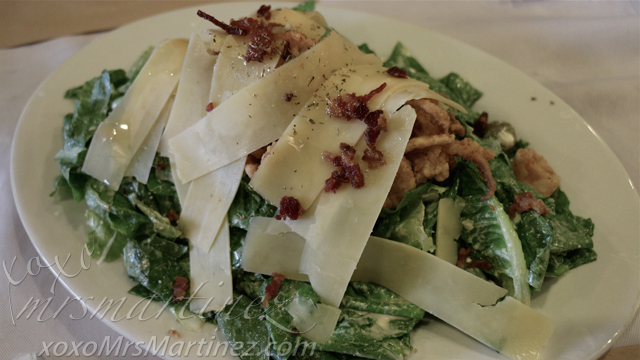 I love the dressing used in Caesar Salad. It was made from 100% Greek yogurt so it's fat free. The Fried Kalamari (add Php 195) on top was super crunchy and tasty! You can also opt to add Baked Chicken for only Php 165. He also ordered one of my favorite dishes and the restaurant's bestseller, Greeka Roast Lamb- a 5-hour roast lamb that falls off the bone. Worth every peso! 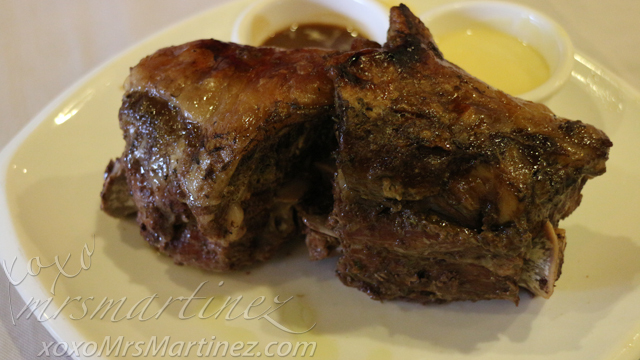 Although the meat was tender, I find Krasates quite pricey at Php 525. You get 2 pcs. 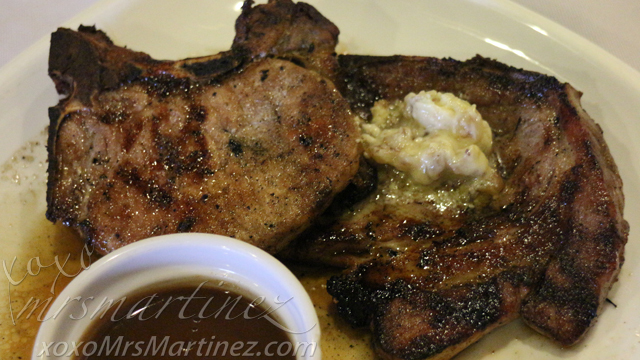 grilled pork chop served with blue cheese walnut and Greeka's signature gravy with every order. I suggest ordering Greeka Baby Back Ribs instead. 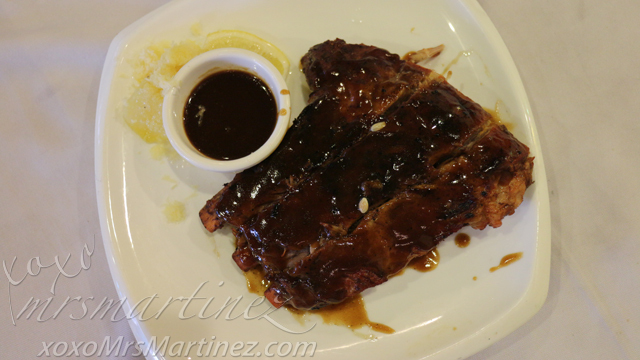 It's a 3/4 slab of tender barbecue pork ribs grilled to satisfy your cravings! Each order of main entree comes with a side dish. You can choose from the 16 side dishes to go with your main course. Pastitsio is a Greek Mediterranean baked macaroni dish with ground beef and Bechamel sauce. 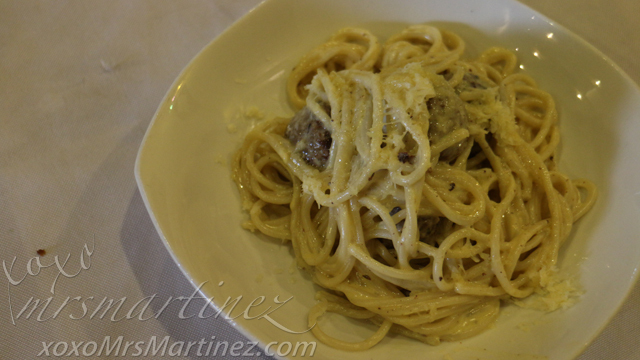 My favorite is Arni Keftedes Pasta because it's so creamy and delicious. By the way, did I tell you that the meatball is made of lamb too? It is served with spaghetti and Parmesan cheese. 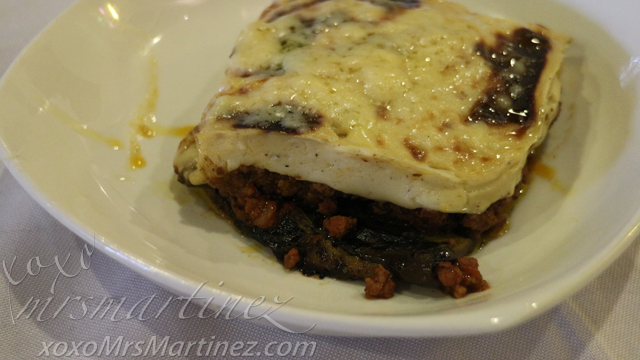 My sister loved Greeka Kouzina's version of Moussaka. 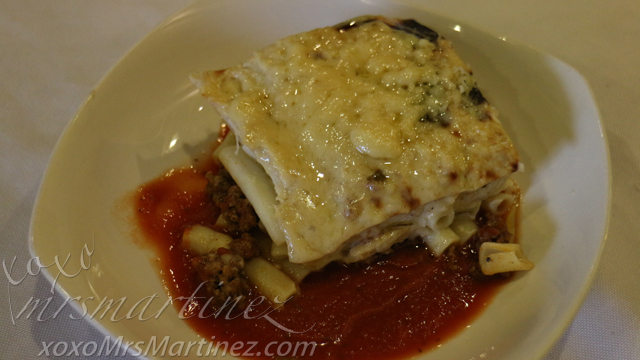 It's a delectable grilled eggplant layered with beef tomato sauce and cheesy Bechamel. The Sidings are also available for separate order for Php 195 each. Here are the rest of the side dishes: Spanakorizo (Spinach Rice), Roka Garides Pasta (Shrimp Pasta with Roka), Vegetable Pesto Pasta, Yemistes (Stuffed Pepper with Rice), Stuffed Zucchini with Agolemono Sauce (Seasonal)), Salata Horiatiki (Greek Salad), Greek Couscous Salad, Greeka Patates Tiganites (Greeka Poutine), Patates Fournou Lemonates (Baked Potato), Lamb Ragu, Salata Marouli, Greek Pita and Arugula Pasta. After all these years, Greeka Kouzina still serves quality, good food plus the quantity is still the same. I will definitely be back! Greeka Kouzina is located at Unit 4 & 5, 285 P. Guevarra St., San Juan with telephone number 624 5974.